Aim for a great run this 2019 and jumpstart the year of the earth pig healthy and kickin’! Run with us at the FedRun 2019 this February 17 at SM by the Bay! The event was launched in celebration of Federation of Filipino-Chinese Alumni Associations Incorporated (FFCAAI) 10th Founding Anniversary and Chinese New Year, and in cooperation with Chinoy TV and race director, AffineateaRaces.com. The Federation of Filipino-Chinese Alumni Associations Incorporated (FFCAAI) is an organization that aims to unite the Filipino-Chinese community. They started the annual FedRun in 2014 which aims to promote camaraderie, healthy and active lifestyle, close family ties and social awareness. 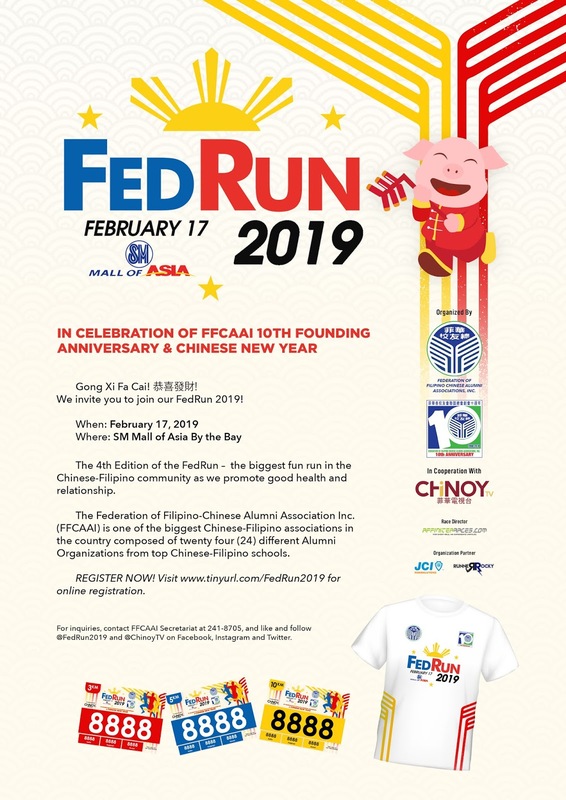 For this Fedrun2019, it will be a thematic run in-line with the Chinese New Year and participants will get a chance to get free tikoy when they register for the 10KM run! Each entry comes with event shirt, race bib, a medal and loot bags. REGISTER NOW! Visit www.tinyurl.com/FedRun2019 for online registration. For inquiries, contact FFCAAI Secretariat at 241-8705, and like and follow @FedRun2019 and @ChinoyTV on Facebook, Instagram and Twitter.